I can’t help but be tempted by the myriad of cheap smart home devices that have appeared lately, but each time I start to seriously consider one the same thing always pricks my balloon of happiness – interoperability. Specifically, that this is none. Just another siloed bit of intelligence leveraging The Cloud with an app on my phone. Wi-Fi security cameras for your home can provide peace of mind when you’re traveling for long periods of time or just at work each day. But they can get expensive quickly: most devices cost around $200 per camera and require subscription fees for long-term monitoring. 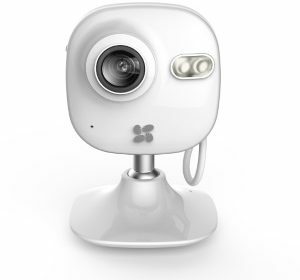 The Ezviz Mini wants to lighten the burden of outfitting your home with one or more Wi-Fi cameras. For just $70, the Ezviz records up to 720p video, takes screenshots periodically, and alerts you if it detects motion. It has many of the features you can find in a Nest Cam, Canary, or Netatmo Welcome device, but with a much cheaper price tag. Of course, you get what you pay for. The Ezviz doesn’t come without caveats, but the newcomer security cam manages to stuff a lot of useful features into its tiny frame. Skylake cannot handle the pressure.